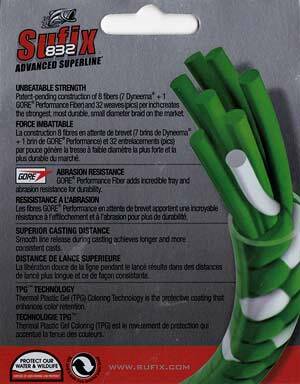 Sufix 832 Advanced Superline here’s what we think about it. Nowadays braided lines are the preferred choice for most anglers whether surfcasting, bottom bouncing, or trout and salmon spinning. Braid has almost no stretch making it possible to stay in touch with your lure or baited hooks; something unheard of back in the days when monofilament fishing line was king. When bottom fishing you can feel your jig hit the bottom even in quite deep water. 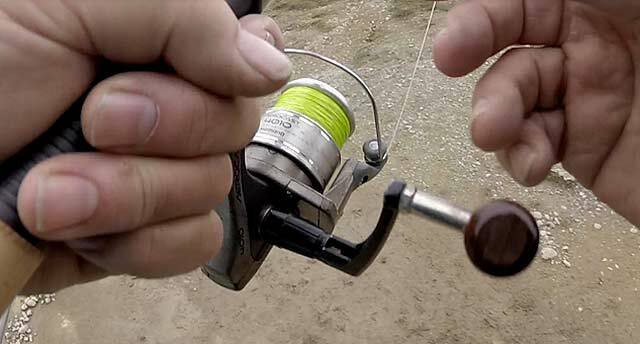 Spin anglers fishing for trout are often able to feel even the slightest touch on the lure. There are many different brands of braid on the market. They are all expensive; though some more so than others. It can be difficult deciding which one to pick. 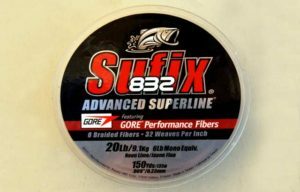 Sufix 832: the picture on the packet showing one of the fibers is Gore Performance Fibers and the other seven are Dyneema. One of the better known braided lines is Sufix 832. It was first released onto the market around five years ago. It is a good seller and proven all around performer. I loaded up my Shimano Aerocast 4010 with a spool of 20 lb test neon lime coloured Sufix 832 at the start of the season. At the same time I performed a simple test on the line. I have since repeated the same test and found the line to still be very close to what it was originally six months earlier. In this respect it has held up surprisingly well. My testing showed that a new spool of 20 lb Sufix 832 Advanced Superline consistently tested at 14 lbs breaking strain. That is to say that when I attached one end to a fixed point and the other to my Salter Super Samson scales and applied pressure the line broke at 14 lbs. I tried the same test 6 times and each time with the same result. Interestingly the line didn’t brake even once at the knot as it invariably does with monofilament. The more recent results were very close to the earlier test, perhaps a pound less at the most. I’m not saying this test is all that scientific. But it is accurate enough for my purpose. Shimano Aerocast 4010 loaded with a spool of 20 lb test neon lime coloured Sufix 832 which is the equivalent of 6 lb monofilament line. Backing will be required to build up the center of the spool for most reels. Load to within 2mm of the spool lip. I landed quite a few kahawai on this little Shimano reel and a 3-6 kg Shimano Catana rod. It was tremendous fun. I doubt I’ll ever go back to river mouth kahawai spinning on anything heavier. Several times I had quite a lot of the 20 lb Sufix 832 out in the surf with an angry kahawai attached. I rather rashly had “top-shot” the Sufix braid onto 6 lb mono without even bothering to join the lines. I simply tied the braid to the spool. No matter as the kahawai weren’t able to pull out the whole 135m – less a couple of meters used in testing the line’s breaking strain. My testing showed that a new spool of 20 lb Sufix 832 Advanced Superline consistently tested at 14 lbs breaking strain. The final test was on several Twizel Canals 20 lb rainbows. If fishing the lightest soft baits you might want to try an even smaller diameter Sufix 832. On the spool of 20 lb Sufix 832 line that I have it says the line diameter is 0.23mm. However, on the sufix.fishing website it says that 20 lb Sufix 832 is much smaller in diameter at 0.15mm. I attached a leader measuring approximately two rod lengths of 15 lb monofilament using the FG knot (which I highly recommend). This setup is great for trout, kahawai and salmon. If surfcasting I would use heavier line 50 lb or even 80 lb Sufix 832. When surfcasting I recommend a mono shock leader heavy enough to prevent bust-offs when casting; yet not so heavy that a buried line would result in significant loss of your braid in the event you are forced to pull the line from a snag. The cost of 275m of 50 lb Sufix 832 is around NZ$70 so it could easily become an expensive trip if fishing a snaggy bottom. Spin fishing is where Sufix 832 comes into its own. The diameter is small yet the line isn’t waxy. It also doesn’t have that horrible flaking some of the earlier braids had. It seems to hold its colour well too. The great thing is it casts well without being plagued by wind knots. I think I only had a couple the whole time I’ve used it. Braid needs to go on the spool fairly tightly. If you notice loose coils forming on the spool after you have been casting for a while it pays to let the line out down the river before winding back on in tight loops. This practice will go a long way to preventing wind knots. Overall Sufix 832 Advanced Superline is great line. It’s not cheap at NZ$39.99 retail for 135m which works out at 29 cents per meter. But it does seem to have excellent longevity. Just be aware that it breaks at about 70 percent of what is stated on the packet. At least the 20 lb spool that I purchased did anyway! I’ll test out some of the lighter Sufix 832 and let you know how it goes. We would love to hear your experience and comments on Sufix 832 in the comments section below.